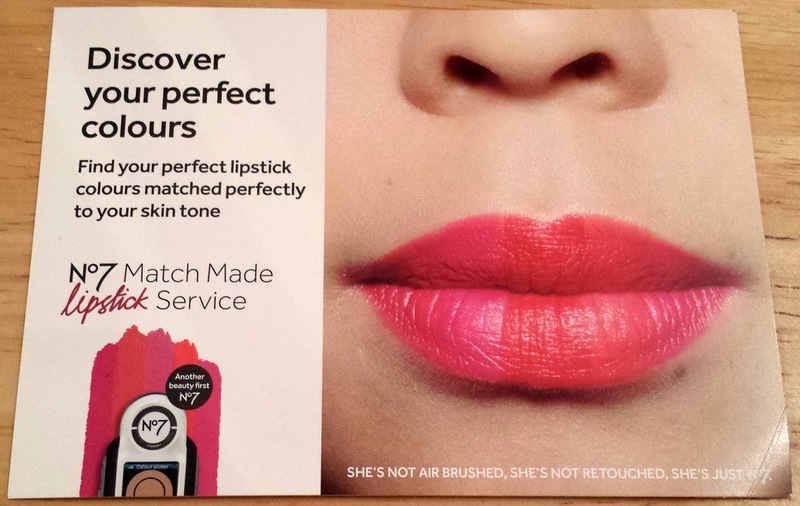 No7 has recently expanded their Match Made Service to include a colour match for your lips. 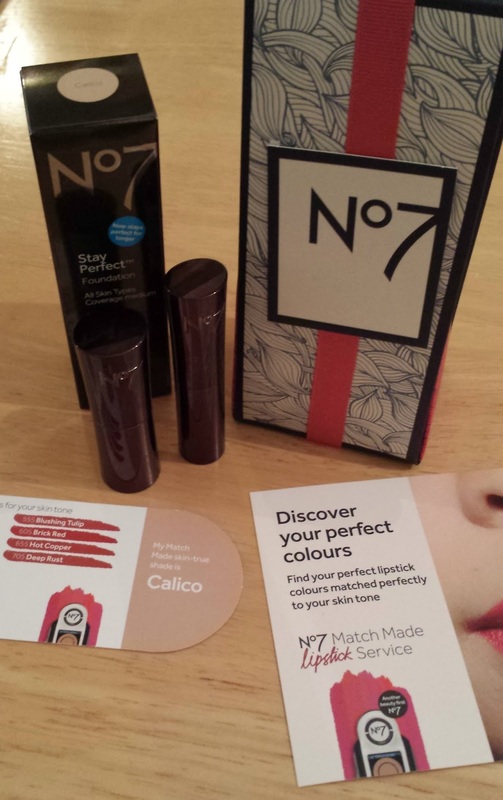 The No7 Match Made Service involves a small machine, which reads your skin colour precisely and matches it to the correct shade of foundation and concealer. This service has very recently been improved to also recommend a lipstick colour, from a wide range, to perfectly match your skin tone. 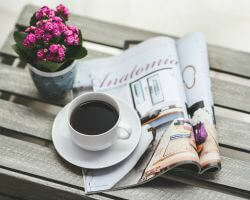 You can narrow down the selection by choosing from your desired colour range of plums, pinks, reds, corals and natural colours. This week I had my colour match at No7 and I was really impressed. It only takes a few minutes for the device to tell you which shade your skin is matched to and it even tells you if it's a perfect match or not. I was matched to Calico, the lightest shade, no surprise there! The Stay Perfect foundation is suitable for all skin types, even sensitive, and gives medium coverage. 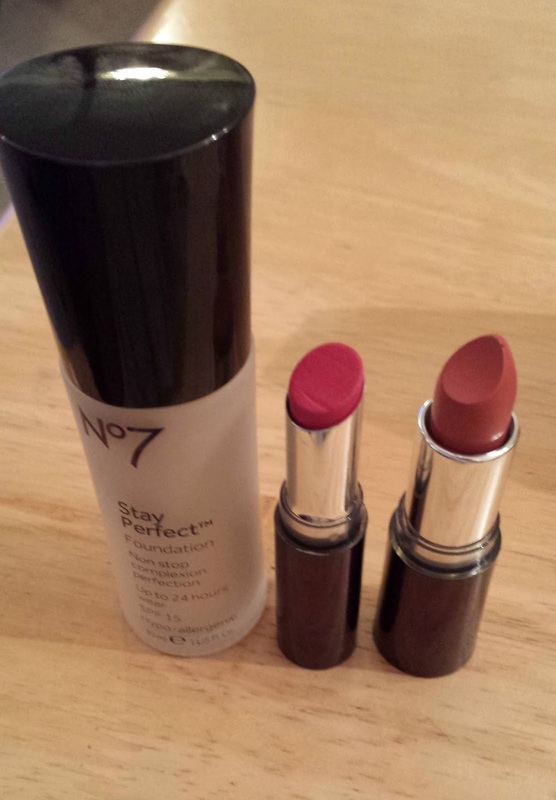 There are two lipstick ranges the service recommends to you, but it also gives you an idea of shades to look for if you like other products in the No7 lip ranges (they have a few). The two ranges are Moisture Drench and Stay Perfect and I got one of each. The Moisture Drench is pretty self-explanatory by name; it is extremely moisturising and has a nice creamy texture to it. 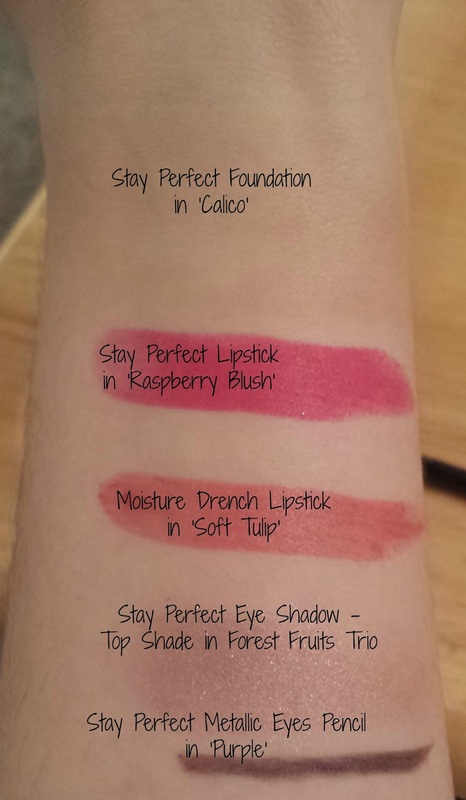 The Stay Perfect range claims to do just that for at least 6 hours and has a more matte finish to it, whilst still being hydrating to the lips. I can 100% confirm that the Stay Perfect range lasts for at least 6 hours! 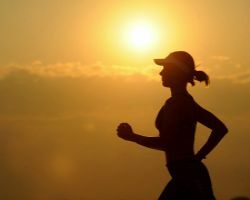 I chose the second brightest shade 'Raspberry Blush' and it stays bright for the best part of the day, even after drinking from my bottle of water. The only slight downfall I have found with this range is that after about the 4 hour mark, it can feel a little drying on my lips. Now, that may just be my lips, but I do take very good care of them. I have found a workaround for this slight drying effect though and that is, I put a lip balm on before my lipstick. The lipstick feels so moisturising all day and it doesn't affect the colour at all. The lasting power maybe decreases to about 4 hours, but I'd say that's still pretty good for a lipstick without the need to top up and I'm happy with this result. The Moisture Drench has such a lovely creamy finish to it and although it doesn't have quite as good staying power as the Stay Perfect, I'd say I've managed a good 3 hours with this one, without the need to top up and my lips have still felt really hydrated. I chose a slightly softer colour with the Moisture Drench, 'Soft Tulip'. I highly recommend you pop in to your nearest No7 counter and take advantage of the Match Made Service; I have no doubt you will be impressed and find something you like. You'd be amazed at the shades the recommendations make you try and what actually suits you. 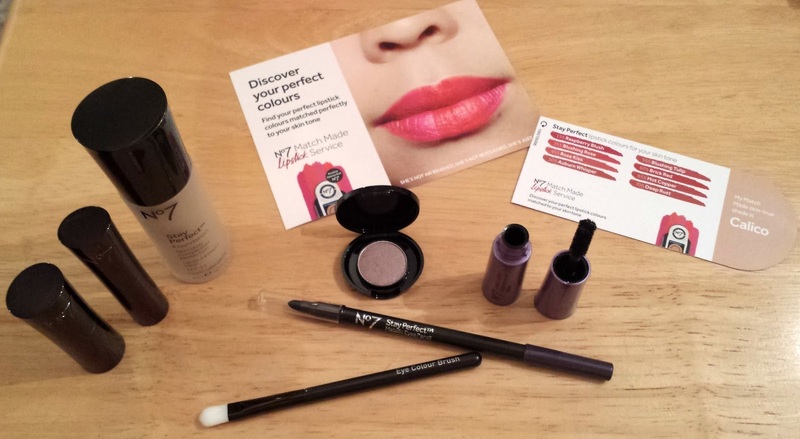 No7 currently have a deal on too, if you buy any two cosmetics (your Match Made foundation and lipstick perhaps); you receive the No7 Exquisite Eyes gift set for free, worth £26. The gift includes an eye shadow, an eye pencil, an eye brush (which I am absolutely in love with) and mascara. Have you already found your perfect colour matches? What shades did you go for?